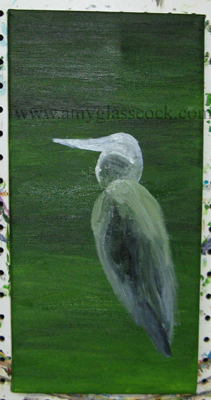 9.27.2010>>> I am going to paint more birds that I saw @ Jungle Gardens in Sarasota, Florida. This time a flamingo and a heron. 2 paintings @ once! Oh my! Woodlands Waterway Art Festival that I am going to have a booth @ in April 2011! 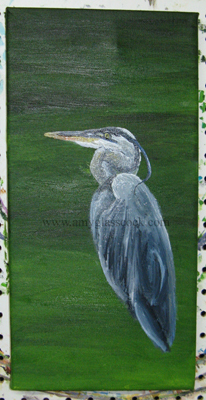 This is the background for my heron painting. It is green water. 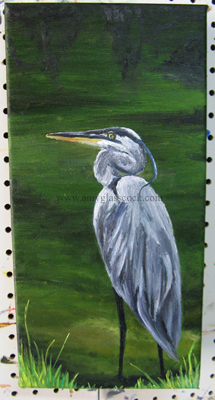 I painted in the basic shape of the heron today. I started painting his face and feathers. 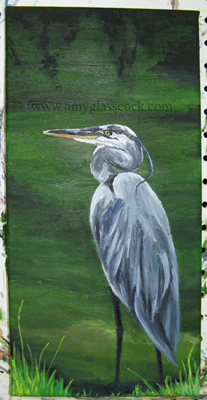 I worked on the water in the background, added to his feathers and added his legs. I also added some grass in the foreground. I worked on his beak and head today.